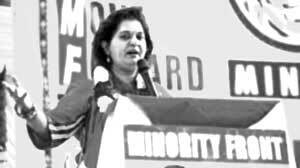 The Minority Front (MF) held its manifesto launch in Chatsworth on Saturday, 02 March. The party leader Shameen Thakur-Rajbansi, a member of the legislature in KwaZulu-Natal, and the widow of former MF and National People’s Party Amichand Rajbansi, received a rousing welcome at the launch. The MF is to contest this year’s general elections on the provincial and national ballots with the aim of making a return to parliament after a five-year hiatus. Delivering her party’s manifesto, leader, Shameen Thakur-Rajbansi, said that since the dawn of democracy Africans had been given more than equal opportunities and they had been more equal than Indians. The manifesto ended with opposition political party T-shirts being set alight by apparent defectors to the Mf at the launch, “We didn’t force it. It was their way of showing they were fed up with their old parties”, confirmed party spokesperson Cllr, Jonanthan Annipen.This took place at a rally at the Rajput Hall in Chatsworth, Durban, where the party was launching its manifesto for the elections on 8 May. “Several members of other political parties defected from their parties to join the Minority Front,” he said. T-shirts that from the DA, ANC and EFF. Annipen emphasised that, “As a party ourselves we didn’t burn those shirts.” They are hoping to increase their presence in the KwaZulu-Natal legislature beyond the seat Thakur-Rajbansi holds, and get two seats in the National Assembly.